"Mengistu" redirects here. For other people with the same given name, see Mengistu (name). Mengistu Haile Mariam (Amharic: መንግስቱ ኃይለ ማርያም, pronounced [mənɡɨstu haɪlə marjam]; born 21 May 1937) is an Ethiopian politician who was the leader of Ethiopia from 1977 to 1991. He was the chairman of the Derg, the military junta that governed Ethiopia, from 1977 to 1987, and the President of the People's Democratic Republic of Ethiopia (PDRE) from 1987 to 1991. The Derg took power in the Ethiopian Revolution following the overthrow of Emperor Haile Selassie I in 1974, marking the end of the Solomonic dynasty which had ruled Ethiopia since the 13th century. Mengistu purged rivals for power from the Derg and made himself Ethiopia's dictator, attempting to modernize Ethiopia's feudal economy through Marxist-Leninist-inspired policies such as nationalization and land redistribution. His bloody consolidation of power in 1977–1978 is known as the Ethiopian Red Terror, a brutal crackdown on opposition groups and civilians following a failed assassination attempt by the Ethiopian People's Revolutionary Party (EPRP) in September 1976, after they had ignored the Derg's invitation to join the union of socialist parties. 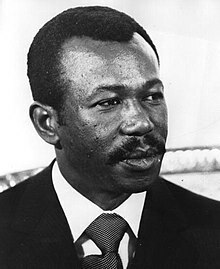 Internal rebellion and government repression characterized Mengistu's presidency, the Red Terror period being a battle for dominance between the Derg, the EPRP and their rivals the All-Ethiopia Socialist Movement, who had initially aligned themselves with the Derg. While this internal conflict was being fought Ethiopia was threatened by both Somali invasion and the guerilla campaign of the Eritrean People's Liberation Front who demanded independence for Eritrea, then a province of Ethiopia. The Ogaden War of 1977–1978 over a disputed border region with Somalia was notable for the prominent role of Mengistu's Soviet and Cuban allies in securing an Ethiopian victory. The catastrophic famine of 1983–1985 is what brought his regime the most international attention. Mengistu left for Zimbabwe in May 1991 after the PDRE National Assembly dissolved itself and called for a transitional government. His departure brought an abrupt end to the Ethiopian Civil War. Mengistu Haile Mariam still lives in Harare, Zimbabwe, and remains there despite an Ethiopian court verdict finding him guilty in absentia of genocide. His regime is estimated to be responsible for the deaths of at least 1,200,000 Ethiopians, to over 2,000,000. Mengistu's Oromo father, Haile Mariam Wolde Ayana, was born in Furii, the then 8 km west of Addis Ababa (now in Addis Ababa due to the city's growth). He was in the service of the Shewan landowner Afenegus Eshete Geda, who had encountered him while he was on a hunting expedition in the administrative district of Gimira and Maji, then under the governorship of Dejazmach Taye Gulilat. He later became an enlisted man in the Ethiopian army. Afenegus Eshete Geda was the half-brother of Dejazmach Kebede Tessema's wife, Woizero Yitateku Kidane, and it was through this connection that Mengistu's parents are alleged to have met. Unsubstantiated accounts allege that Mengistu's mother was the illegitimate daughter of Dejazmach Kebede Tessema, a high ranking nobleman and Crown Councilor to Emperor Haile Selassie, and himself suspected of being the illegitimate son of Emperor Menelik II. These rumors of Mengistu being the grandson of Dejazmach Kebede are widely believed, but have never been confirmed by either Mengistu himself or by the late nobleman's family. Mengistu followed his father and joined the army, where he attracted the attention of the Eritrean-born general Aman Andom, who raised him to the rank of sergeant and assigned him duties as an errand boy in his office. Mengistu graduated from the Holetta Military Academy, one of the two important military academies of Ethiopia. General Aman then became his mentor, and when the General was assigned to the commander of the Third Division took Mengistu with him to Harar, and later was assigned as Ordnance officer in the 3rd division. A few years before his departure for training to the US he was in conflict with the then 3rd Division commander General Haile Baykedagn whose policy of strict discipline and order did not sit well with Mengistu. At the time, the Ordnance group was offered military technical training support in the US. Despite his disapproval of Mengistu's insubordination and disrespect, the General was obliged to release him and Mengistu went for a six-month training program in Maryland, United States. Returning after his training, he was expected to command the Ordnance Sub-division in Harar. Years later, Mengistu would murder General Haile Baykedagn along with the 60 ministers and generals. Mengistu Haile Mariam with fellow Derg members Aman Mikael Andom and Atnafu Abate. Emperor Haile Selassie's government, having lost the confidence of the Ethiopian public following a drought and crop failures in Wello province, was overthrown in Ethiopian revolution of 1974. As a result, power came into the hands of a committee of low ranking officers and enlisted soldiers led by Atnafu Abate, which came to be known as the Derg. Mengistu was originally one of the lesser members, officially sent to represent the Third Division because his commander, General Nega Tegnegn, considered him a trouble-maker and wanted to get rid of him. But between July and September 1974, Mengistu was a member of the Derg, though he preferred to act through more public members like his former mentor, general Aman Andom, and later Tafari Benti. Mengistu and Atnafu Abate were the deputy chairmen of Derg from March 1975 to February 1977. From 1977 through 1978, resistance against the Derg ensued, led primarily by the Ethiopian People's Revolutionary Party (EPRP). Mengistu cracked down on the EPRP and other revolutionary student organizations in what would become called the "Red Terror". The Derg subsequently turned against the socialist student movement MEISON (Amharic: መላ ኢትዮጵያ ሶሺያሊስት ንቅናቄ), a major supporter against the EPRP, in what would be called the "White Terror". In the 1970s, Mengistu embraced the philosophy of Marxism–Leninism, which was increasingly popular among many nationalists and revolutionaries throughout Africa and much of the Third World at the time. In the mid-1970s, under Mengistu's leadership, the Derg regime began an aggressive program of changing Ethiopia's system from a mixed feudo-capitalist emergent economy to an Eastern Bloc-style command economy. Shortly after coming to power, all rural land was nationalized, stripping the Ethiopian Church, the Imperial family and the nobility of all their sizable estates and the bulk of their wealth. During this same period, all foreign-owned and locally owned companies were nationalized without compensation in an effort to redistribute the country's wealth. All undeveloped urban property and all rental property was also nationalized. Private businesses such as banks and insurance companies, large retail businesses, etc. were also taken over by the government. All this nationalized property was brought under the administration of large bureaucracies set up to administer them. Farmers who had once worked on land owned by absentee landlords were now compelled to join collective farms. All agricultural products were no longer to be offered on the free market, but were to be controlled and distributed by the government. Despite progressive agricultural reforms, under the Derg, agricultural output suffered due to civil war, drought and misguided economic policies. There was also a famine in 1984, which was the 10th anniversary of the Derg. The Soviets hailed Ethiopia for its supposed similar cultural and historical parallels to the USSR. Moscow said it proved that a backward society could become revolutionary by adopting a Leninist system. It was hailed as a model junior ally that Moscow was eager to support. In the 1980s Ethiopia plunged into greater turmoil and the Soviet system itself was collapsing by 1990. Russian commentators turned scornful of the Ethiopian regime. Mengistu still resides in Zimbabwe, despite the Ethiopian government's desire that he be extradited. He is said to live in luxurious circumstances, and it is claimed that he advised Mugabe on security matters; according to Zimbabwean intelligence sources, he proposed the idea of clearing slums, which was implemented as Operation Murambatsvina in 2005, and chaired meetings at which the operation was planned. State Security Minister Didymus Mutasa strongly denied that Mengistu was involved in Operation Murambatsvina in any way, saying that Mengistu "does not interfere at all with the affairs of our country. We also do not allow him to interfere with his country from Zimbabwe." “The biggest problem with prosecuting Mengistu for genocide is that his actions did not necessarily target a particular group. They were directed against anybody who was opposing his government, and they were generally much more political than based on any ethnic targeting. Some experts believe hundreds of thousands of university students, intellectuals and politicians (including Emperor Haile Selassie) were killed during Mengistu's rule. Amnesty International estimates that a total of half a million people were killed during the Red Terror of 1977 and 1978[dubious – discuss] Human Rights Watch describes the Red Terror as "one of the most systematic uses of mass murder by a state ever witnessed in Africa." During his reign it was not uncommon to see students, suspected government critics or rebel sympathisers hanging from lampposts each morning. Mengistu himself is alleged to have murdered opponents by garroting or shooting them, saying that he was leading by example. Estimates of the number of deaths for which he was responsible range from 500,000 to over 2,000,000. Following an appeal on 26 May 2008, Mengistu was sentenced to death in absentia by Ethiopia's High Court, overturning his previous sentence of life imprisonment. Twenty-three of his most senior aides also received death sentences that were commuted on 1 June 2011. As of 4 October 2011, 16 of former Mengistu officials have been released from prison on parole, due to their old age and good behavior while incarcerated. However, Mengistu's sentence remained unchanged. Mengistu Haile Mariam-led brutal military dictatorship (Derg) also used the 1983–1985 famine in Ethiopia as government policy (by restricting food supplies) for counter-insurgency strategy (against Tigray People's Liberation Front guerrilla-soldiers), and for "social transformation" in non-insurgent areas (against people of Tigray province, Welo province and such). Due to organized government policies that deliberately multiplied the effects of the famine, around 1.2 million people died in Ethiopia from this famine where most of the death tolls were from the Wollo and Tigray provinces. ^ His grandmother, Woyzero Abebech, was still alive when he seized power and had become an Orthodox nun (as is very common amongst elderly women in Ethiopia). Woyzero Abebech lost her land that she inherited from Empress Zewditu, whom she had served as an attendant, as well as her husband. She continued to live in a place known as Addis Alem not far from Addis Ababa and was said to have been furious at the nationalization of her land by her grandson's government. Mengistu's father was said to have defiantly hung Emperor Haile Selassie's portrait on the walls of his living room in the villa that the Prime Minister, Fikre Selassie Wogderess, built for him in the middle-class district of Asmera Menged. ^ a b "Mengistu Haile Mariam | president of Ethiopia". Encyclopedia Britannica. Retrieved 2018-04-07. ^ "Mengistu Haile Mariam's Biography". Durame News Online. 1 May 2012. Retrieved 2012-05-06. .
^ a b "BBC NEWS | Africa | Mengistu found guilty of genocide". news.bbc.co.uk. Retrieved 2017-01-08. ^ a b "Peter Gill, page.44 "Famine and Foreigners: Ethiopia Since Live Aid"" (PDF). ^ a b "Dawit Wolde Giorgis, "Red Tears: War, Famine, and Revolution in Ethiopia"". ^ a b Edmund J. Keller, Revolutionary Ethiopia (Bloomington: Indiana University Press, 1988), p. 185. ^ a b Paul B. Henze, Layers of Time (New York: Palgrave, 2000), p. 290 n. 13. In Mengistu's last interview, he mentioned that he knew Kebede Tesemma, but denied a blood relationship. ^ Jeffrey Gettleman, 'Ethiopian court convicts Mengistu Haile Mariam of genocide', New York Times, 12 November 2006. Paul Henze, however, states this accusation as a fact (Layers of Time, p. 188). ^ "Mengistu Haile Mariam | president of Ethiopia". Encyclopedia Britannica. Retrieved 2018-06-03. ^ Leonard, Thomas M. (2005). Encyclopedia of the developing world. New York: Routledge. p. 739. ISBN 1579583881. OCLC 60705727. ^ ""Gorbachev's Holocaust", by Michael Johns, Policy Review, June 1988, pp. 74-75". UNZ.org. Retrieved 4 February 2015. ^ "Ethiopia Fizzled Coup", Time, 29 May 1989 (accessed 30 July 2009). ^ The Washington Times, 11 July 1996, page A10. ^ a b c "Mengistu 'brains behind Zim clean-up'". mg.co.za. 20 February 2006. Retrieved 2018-02-18. ^ "Ethiopia's Mengistu brains behind Zimbabwe cleanup campaign". Sudan Tribune. 21 February 2006. Retrieved 24 March 2014. ^ "The irony of the Anuak Masscare and Zenawi's genocide verdict over Mengistu". Retrieved 4 February 2015. ^ clayton, Jonathan. "Guilty of genocide: the leader who unleashed a 'Red Terror' on Africa | The Times". The Times. Retrieved 2017-01-08. ^ "Ethiopia's Mengistu Haile-Mariam speaks". Archived from the original on 6 February 2015. Retrieved 4 February 2015. Coppa, Frank. 2006. "Mengistu Haile Mariam." Encyclopedia of Modern Dictators: From Napoleon to the Present, Frank Coppa, ed., pp. 181–183. Peter Lang Publishing. ISBN 978-0-8204-5010-0. Applebaum, Anne (foreword) and Hollander, Paul (introduction PDF file and editor) From the Gulag to the Killing Fields: Personal Accounts of Political Violence and Repression in Communist States. Intercollegiate Studies Institute (2006). ISBN 1-932236-78-3. Scott Rempell, "Five Grounds: A Novel," ISBN 1479201723.